What have I told you ever since we came to Montreal? Sophie quickly looked across to Luc. This wasn't the scolding she'd expected. That I had to watch what I said because we could all get into trouble. That if I said the wrong thing and the wrong people heard me, we could all be charged with treason. And, today you saw just how serious treason is, Sophie. That could have been any of us on trial. A couple of the things we did during the rebellion made us just as guilty as some of those men. Luc nodded, his face haggard. I feel terrible, Lady Theo. I know that I'm far more guilty than some of them. The second book in Beverley Boissery's Sophie trilogy, Sophie's Treason, picks up from where Sophie's Rebellion concluded. After quelling the 1837-1838 French Rebellion in Lower Canada, the English are looking to punish the insurgents and anyone who played a role in helping to fuel the unrest. As a result, young Sophie Mallory and Luc Moriset and their families and friends are all in danger or recriminations. Sophie's Treason begins in Montreal in December 1838, two months after Sophie and Luc's first meeting in Vermont. 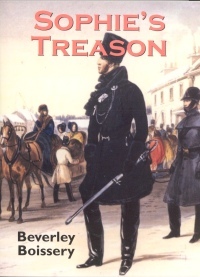 Luc's brother, Marc, is on trial for treason, while Sophie's father, Benjamin, is missing, believed to have been either imprisoned or killed by the British. As it turns out, Benjamin is, indeed, alive, unjustly imprisoned for supposedly engaging in war against the British. Adding to the complexity of the situation is Benjamin's amnesia, a result of his injuries after severe punishment from his captors. Primarily a historian and author of nonfiction, Boissery's attention to detail is commendable. At the same time, however, it does conflict somewhat with the needs of her young adult, middle school audience. Over 250 pages in length, with 21 chapters, the book seems sometimes to progress only slowly. At the heart of Sophie's Treason is courtroom procedure and legal maneuverings–essentially a battle to keep Marc from the death penalty. Many young adult readers will find some of these episodes burdensome. It is an unfortunate criticism because Boissery writes well. She is descriptive and articulate, but in Sophie's Treason, as with Sophie's Rebellion, the density of the book is likely to see many readers' attention waiver and drop off before they have the chance to develop the interest necessary for them to want to see the book through to its conclusion. Lady Theodosia Thornleigh is a strong female character who, like most of the story's central characters, is well crafted, containing a satisfying mix of depth and complexity. Perhaps even more so than either Sophie or Luc, in my opinion, Lady Theo emerges from Sophie's Treason as the book's heroic figure. I was surprised by the enthusiastic optimism of the characters at the end of the book. Although Marc and Benjamin's lives are spared, in the 1830s, transportation to Van Diemen's Land or the penal settlements of New South Wales was often viewed as worse than a death sentence, leading on some occasions to suicide. Certainly, there would have been few cases in which a convict began his transportation journey with dreams of fortunes and adventures awaiting him in the penal colony. With her historian's eye, Boissery is an author worthy of inclusion in middle school and high school history classes. Although the central characters are fictional, in her concluding historical note, Boissery informs readers that some characters are based on real life figures. Mature teenaged readers with an interest in Canadian history will likely enjoy Boissery's work. Those willing to persevere through the slower stages of the narrative will find themselves rewarded with a detailed, carefully constructed, often interesting story. Gregory Bryan teaches children's literature classes in the Faculty of Education at the University of Manitoba.